Here is the text (more or less) and the slides for a presentation I’m giving on Friday as part of the Cultural Rhetorics conference at Michigan State University, which is running on October 31 and November 1. I’m happy to be doing this because I want to support this first time conference and because it’s very local and on very friendly territory for me. The only bad thing is I’m presenting at the last session on the Friday of the conference (which is also Halloween! ), so I’m not exactly expecting a standing room only kind of crowd. But we’ll see what happens. Anyway, I am making this post live just before my talk on Friday is underway. I am guessing I’ll have more to post about the conference a bit later. 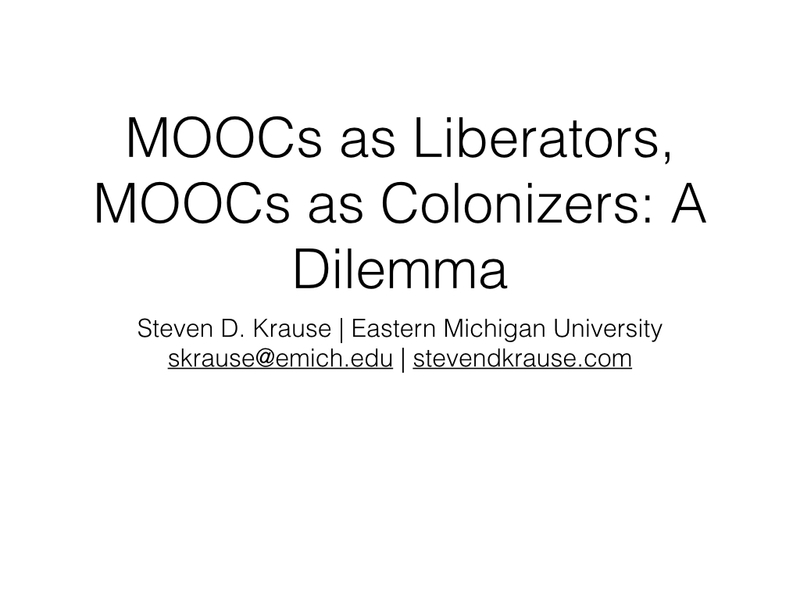 A better title or at least a slightly amended title for my presentation today is “MOOCs as Liberators, MOOCs Colonizers: A Dilemma”. And before I get to the MOOC, liberator, and colonizer part of things, I want to begin for a moment to unpack that term dilemma as both a rhetorical device and a problem of logic. 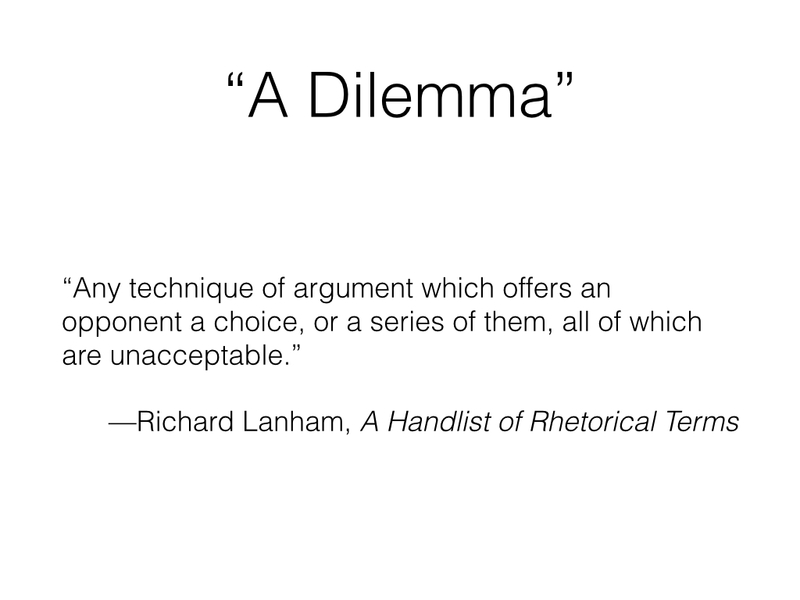 In A Handlist of Rhetorical Terms, Richard Lanham describes a dilemma rhetorically as “any technique of argument which offers an opponent a choice, or a series of them, all of which are unacceptable” (34). So, his example here is when a boss argues “I will not give you a raise; either it will make you lazy and less efficient, or (greedy) and less content.” In terms of logic, Lanham essentially explains dilemmas as a kind of syllogism with competing premises which again result in no good choices. Lanham’s example here is “if welfare legislation feeds the people, they will grow lazy; if it does not feed the people, it will be a failure” (34-35). 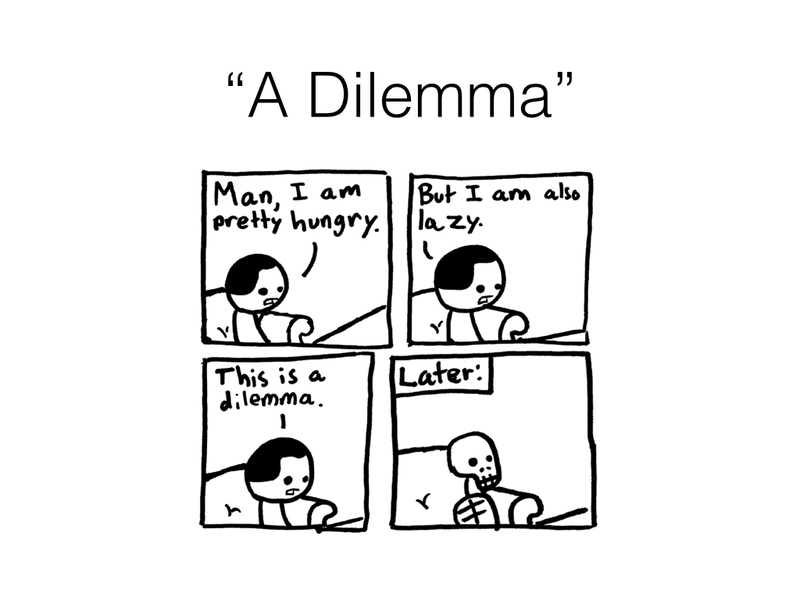 But I think we also have to say that dilemma is a situation where it is still probably better to do something: that is, making a some kind of problematic choice is better than making no choice at all. So in emphasizing the “dilemma” here for a moment, what I mean is there are no clear and good answers to the basic question I’m asking: are Massive Online Open Courses potential liberators for millions of people around the world with no other access to anything that approaches higher education, or are they colonizers in the sense of simply another imposition of Western values and ideologies on the third world. It’s both, and it’s neither. But before I get too far ahead of myself here, let me offer a very brief explanation of MOOCs, just to make sure we’re all on the same page. 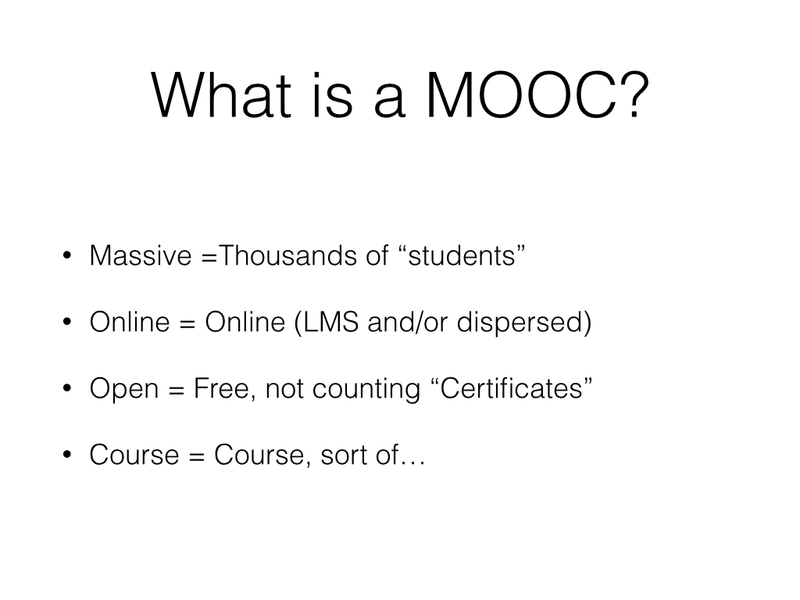 MOOC stands for “Massive Online Open Course.” “Massive” means courses with thousands of students, or at least courses that start with thousands of students, most of who drop out. “Online” means just that, generally through a proprietary learning system or course shell. “Open” means that anyone anywhere with a reliable Internet connection can participate in the course and for free, though the biggest remaining MOOC start-up, Coursera, is offering a program where students can earn an official certificate of completion for a few hundred dollars. 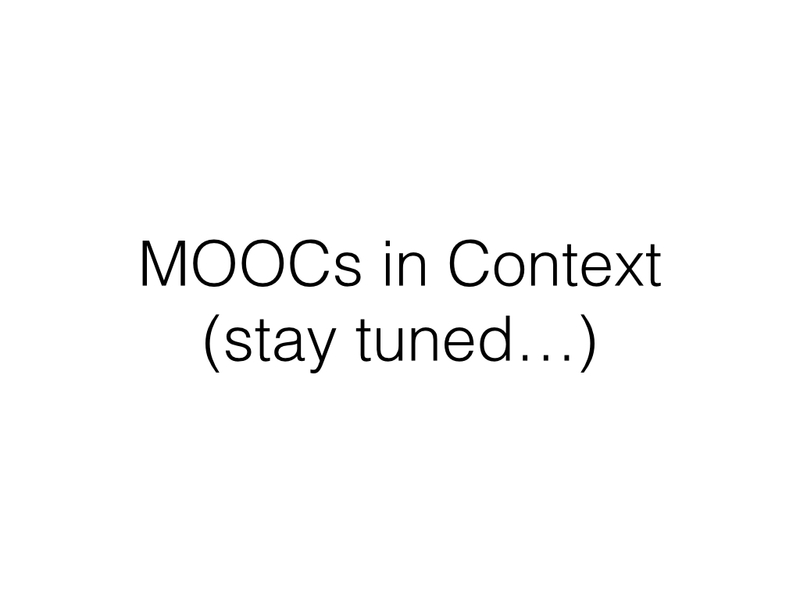 And perhaps the most slippery term is “Course.” That’s probably a metaphor more than anything else because MOOCs aren’t quite “courses” as we usually think of them, but rather, they are more like experiences around a common topic or theme that present an opportunity to learn something. The first MOOCs have their roots in the open access education and “edupunk” movements and the term was coined 2008 in Canada during a class where there was a couple thousand students taking an online class along with a group of paying students. 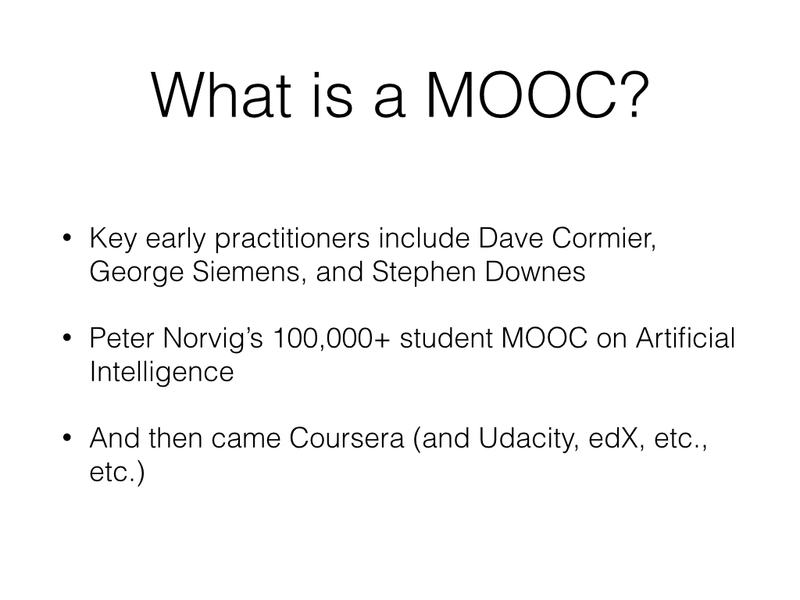 Then in 2011, Peter Norvig taught a MOOC at Stanford that had well over 100,000 students, and that success paved the way for Coursera (and, to a lesser extent, a few other large MOOC providers like Udacity and EdX). 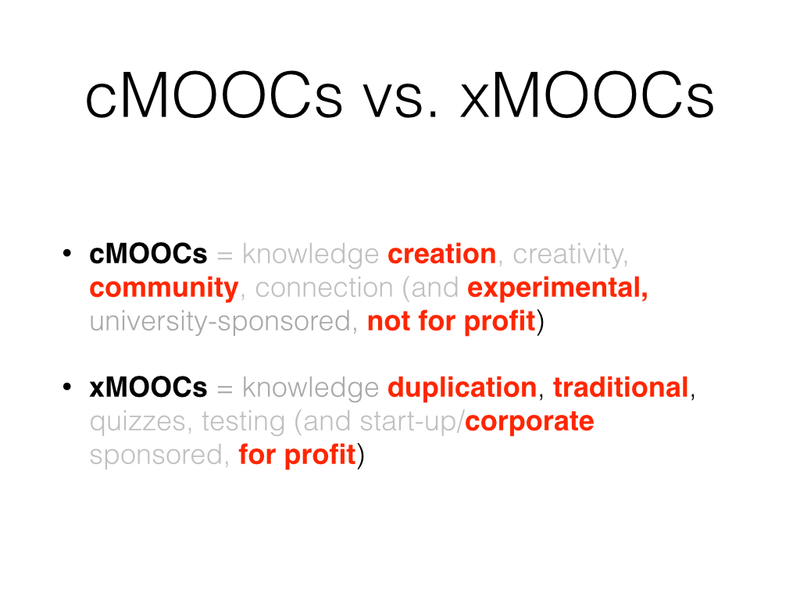 I don’t agree with Siemens claim that xMOOCs scale, but the differences between these kinds of MOOCs deserve some attention: cMOOCs are experiments in community-building in an open-access and emerge from the not for profit educational environment, while xMOOCs re-inscribe traditional notions of higher education delivered online by corporations and for profit. 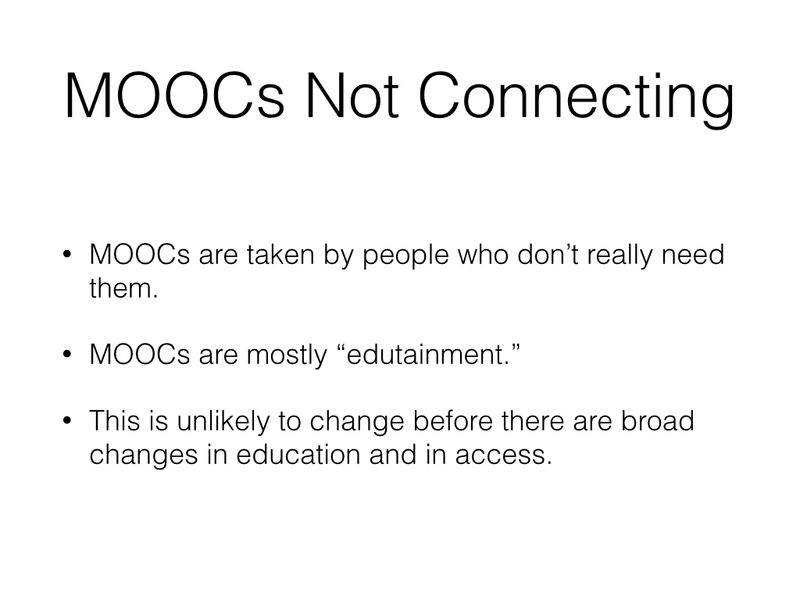 It’s more complicated than that of course, but I think this sums up the source of the fear and the enthusiasm for MOOCs. 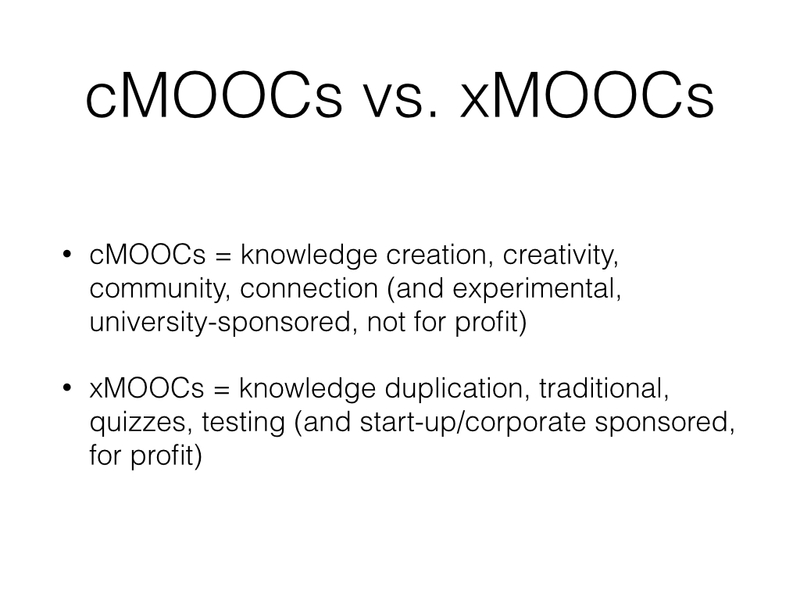 I also think that this difference in approaches to MOOCs speaks to the dilemma of colonization here. 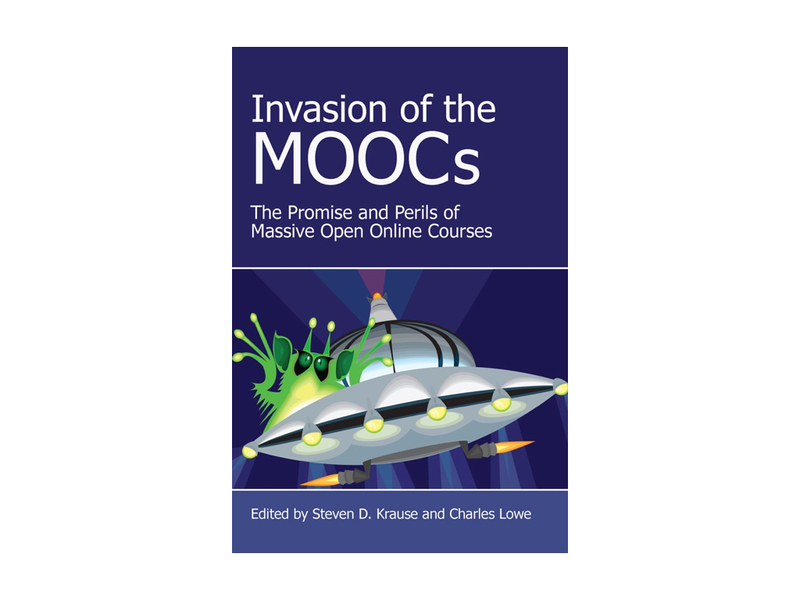 In a very real sense, the concept of MOOCs was colonized in the classic and crudest sense of the term “colonization”: a comparatively small, local, and experimental community-building and cooperative movement was claimed and then warped by corporate and for-profit interests with essentially no acknowledgement of the folks who started MOOCs in the first place. Indeed, to listen to Peter Norvig and Coursera co-founder Daphne Koller speak about MOOCs, you’d think that they came up with the idea themselves, that they originated the very idea of teaching online. 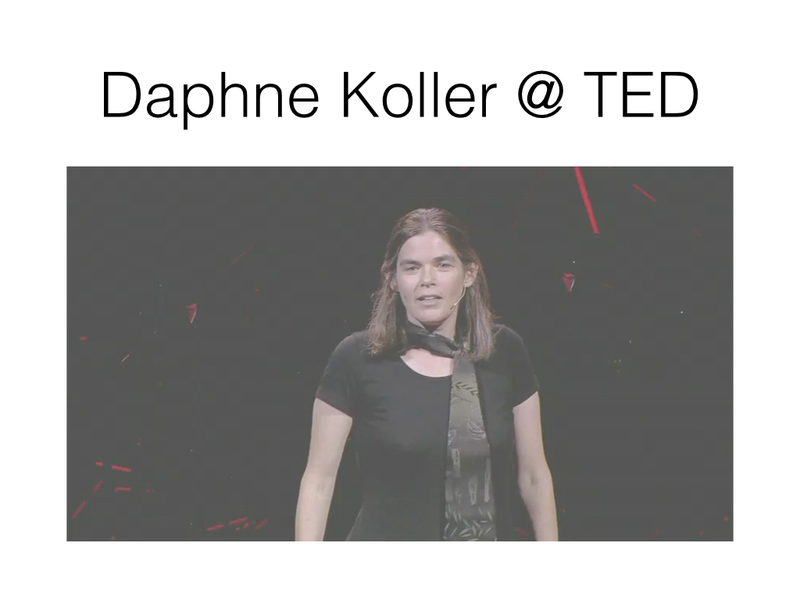 Speaking of Koller, I want to share here a brief bit of video from her 2012 TED talk. This is how she started that talk, which went on to talk more specifically about the start-up company Coursera. (Take a look at the video clip here). When I first came across this video, I was reminded of the South Park episode called “Smug Alert!” where Kyle’s father buys a Toyota Prius and then moves the family to San Franscico to be among similarly self-satisfied and smug people. 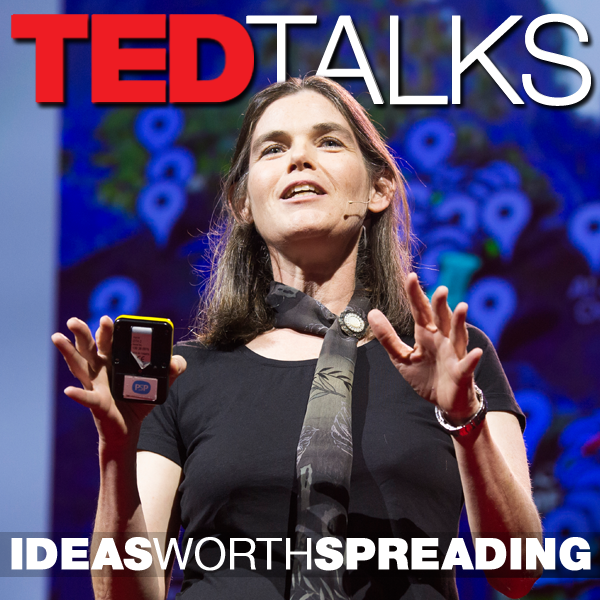 I suppose most TED talks have a bit of that air to them. In any event, I find Koller’s story of self-entitlement here pretty cringe-worthy and I think it is indicative of her overall argument in her talk, that Coursera can bring these poor South African masses access to the great universities and great courses of the world through their MOOCs, and all for free. There is no doubt that the story that Koller tells about the education crisis in South Africa was quite real in 2012 (and it might still be as much in crisis now). Of course, as this New York Times article reported, a lack of access to higher education was not the only problem young blacks were facing. At the time, “The jobless rate among youths is nearly 70 percent, a staggering problem that even a college degree does not promise to solve. 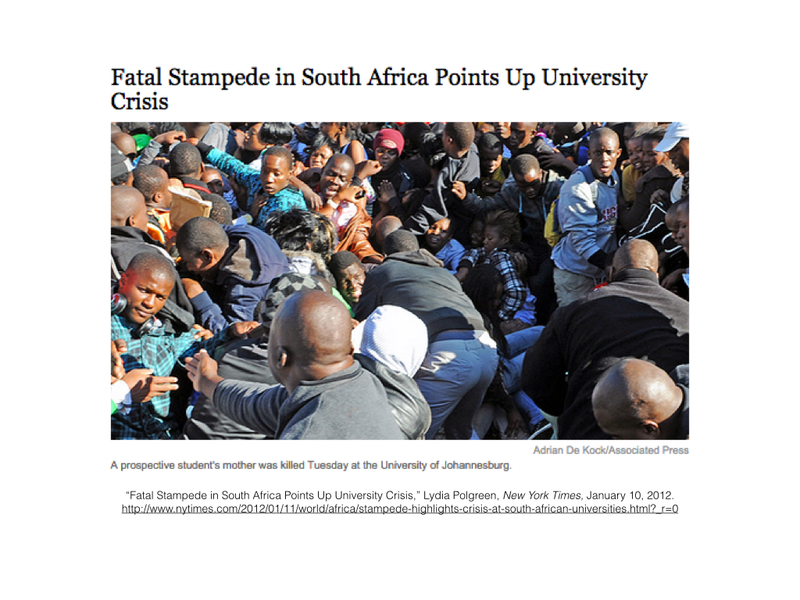 Adcorp, a temporary staffing firm, said in a recent report that there were 600,000 unemployed college graduates in South Africa.” So again, on the one hand, it’s not much of a stretch to see MOOCs– especially in the hands of for-profit enterprises like Coursera– as colonizers, well intention colonizers but colonizers nonetheless. Barlow begins his essay with two stories, one his experiences as a Peace Corps Volunteer and the other from his childhood experiences in behaviorist “teaching machines,” largely as the result of his behavioral psychologist father who was working at Harvard. He connects these two seemingly unrelated experiences early in the essay: “Quite simply, the student enrolled in an xMOOC, I believe, is in much the same position as both the student before the teaching machine and the colonized individual. She or he is forced to deal with foreign assumptions having little to do with the reality of the learner or the colonized” (74). 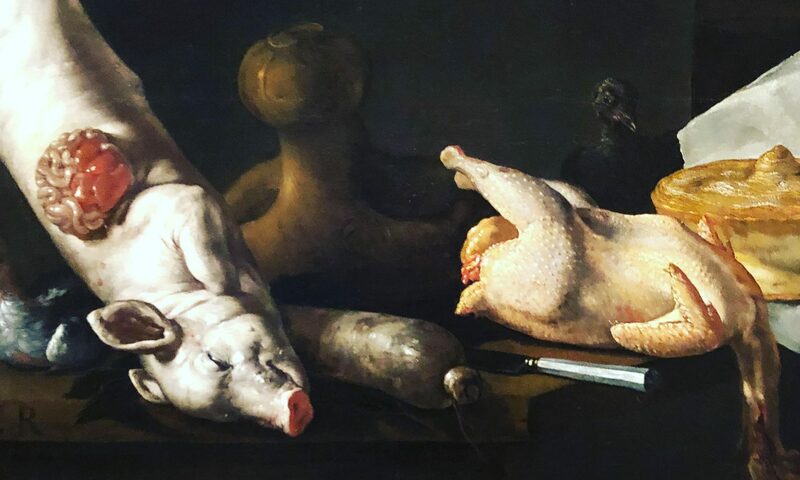 He goes on: “As is true even in the best colonial situations, though colonialist intentions can appear to be benign or even positive, their projects as often seem to stem not from the needs of the intended recipients (who most of them really know nothing about) but from those of the creators (themselves)” (76). 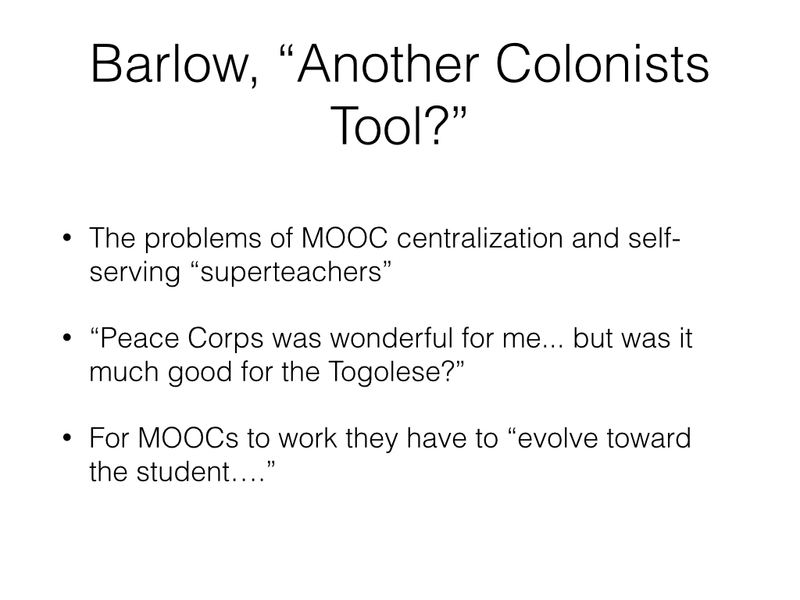 Barlow objects to the centralization of MOOCs at every level– through the course shell set-up, through corporations like Coursera, through the “superteachers” who are the main talking head/lecturer in MOOCs. 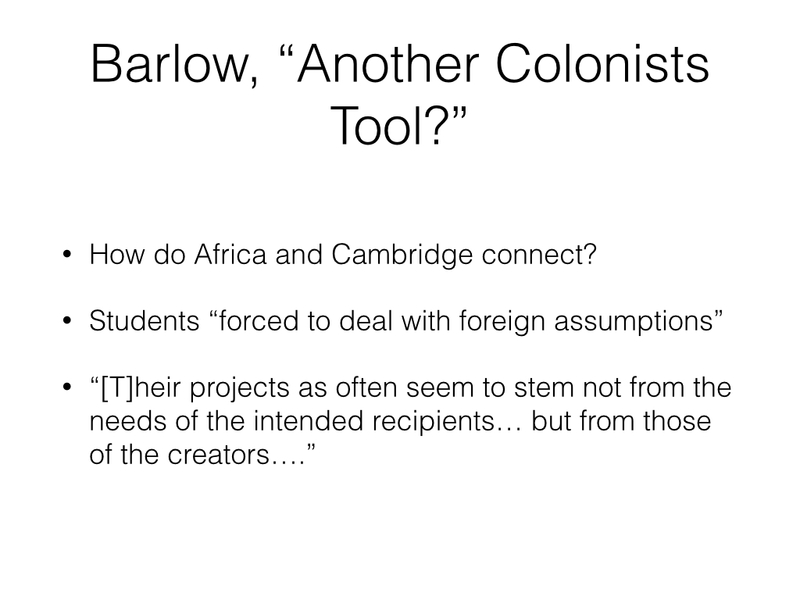 In that sense, MOOCs, again like the classic movements of Colonialism, are not about the colonies but the colonizers. “I learned this in Peace Corps in Togo, work- ing among the ruins of earlier development projects,” Barlow writes. “Peace Corps was wonderful for me… but was it much good for the Togolese? (81)” So for MOOCs to be potentially useful and beneficial for students, it has to put students in the center, it has to “evolve toward the student (and toward student control of the learning) and away from its creators and the hegemonic structures of almost all of contemporary education. Rather than simply creating another tool for dominating educational structures, MOOCs of all types could then become simply one more tool avail- able to students in diverse learning environments…”(84). But of course, these things are always a lot more complicated than that. In a March 2014 article on the New Scientist web site, Gayle Christensen and Brandon Alcorn report on a survey conducted by them and some of their colleagues at the University of Pennsylvania. They surveyed the 400,000 students enrolled in one of UPenn’s (35,000 of them responded). The results basically suggest that MOOCs are not reaching the audience that Koller has in mind, which probably means it isn’t exactly having quite the colonizing impact that Barlow and others imagine. “Two-thirds of participants come from the developed world – the US and other members of the OECD, the club of leading industrialised countries” and “83 per cent of MOOC students already have a two or four-year diploma or degree, even in regions of the world where less than 10 per cent of the adult population has a degree.” The report itself that this article is summarizing also notes that 44.2% of respondents report education beyond a Bachelor’s degree, and the disparity is even worse from those MOOC students who are in developing world countries. 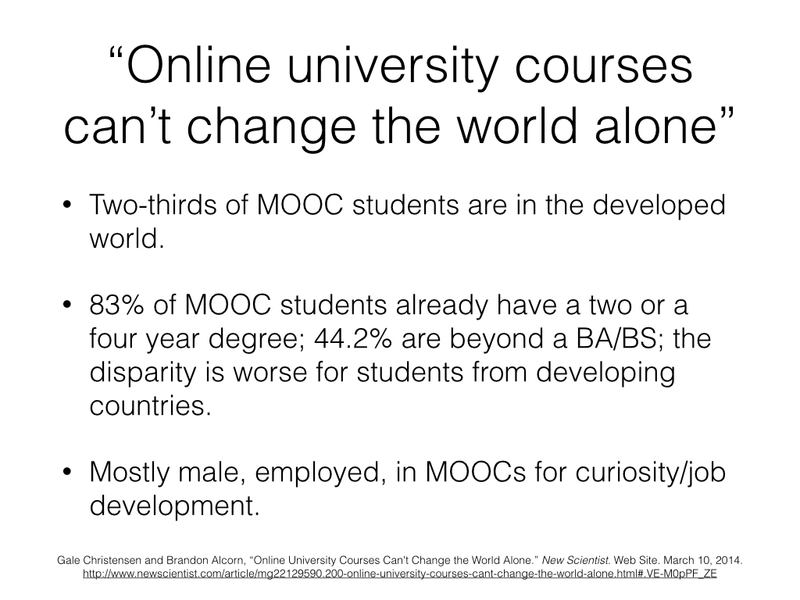 The survey data also indicates that most MOOC students are male (these percentages are also higher in developing world countries) and employed, and their main reason for taking MOOCs (beyond just curiosity) is for professional development. Though this clearly isn’t the whole story. For one thing, this study reports only on students in UPenn MOOCs, which might explain the high percentage of Americans. Coursera has partnered with hundreds of universities and institutions all over the world, though notably, none in Africa so far. And while Coursera is still the largest MOOC enterprise, there are for-profit and non-profit entities outside of the United States who are offering and developing MOOCs, particularly in Asia. I also think that some of this has to do with the type of MOOC; for example, in the first year writing MOOCs I’ve participated in and observed, my sense that a lot of the students were inexperienced in English and were taking the course to improve those skills. Which brings me back to my beginning and as to why the question of MOOCs offering the potential of liberation or colonization seems to me to be a classic dilemma in the sense of no good choices. The kinds of people who have been most active in MOOCs are those who have enough previous education and experience to more or less do college-level work on their own, along with the time and the resources to actually engage in the course. 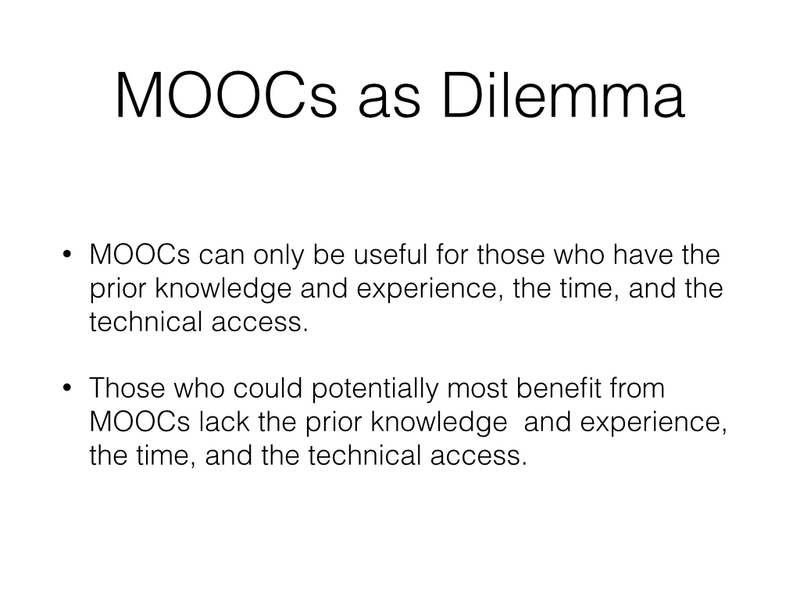 But of course, those who could most benefit from a MOOC lack these things. 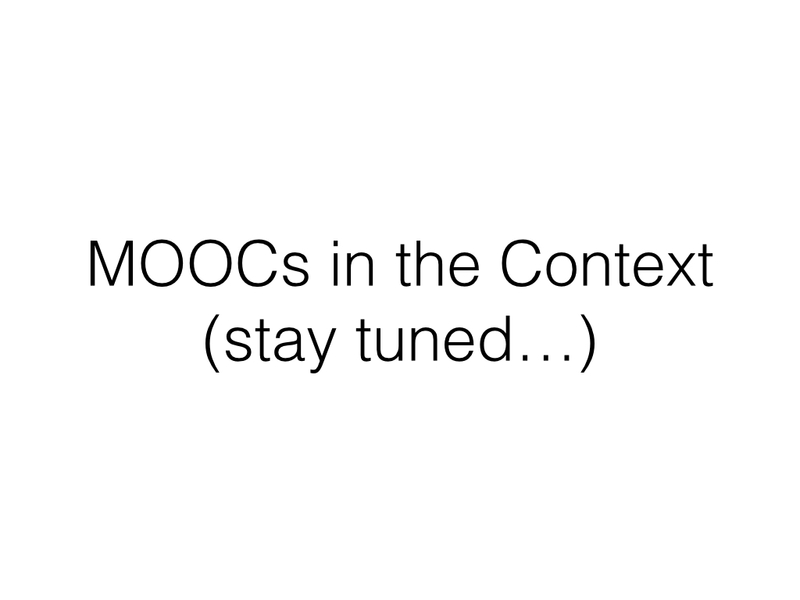 Let me close with just a brief point about what might be “the future” of MOOCs, or at least what I am writing and thinking about now. It has been kind of a wild ride. 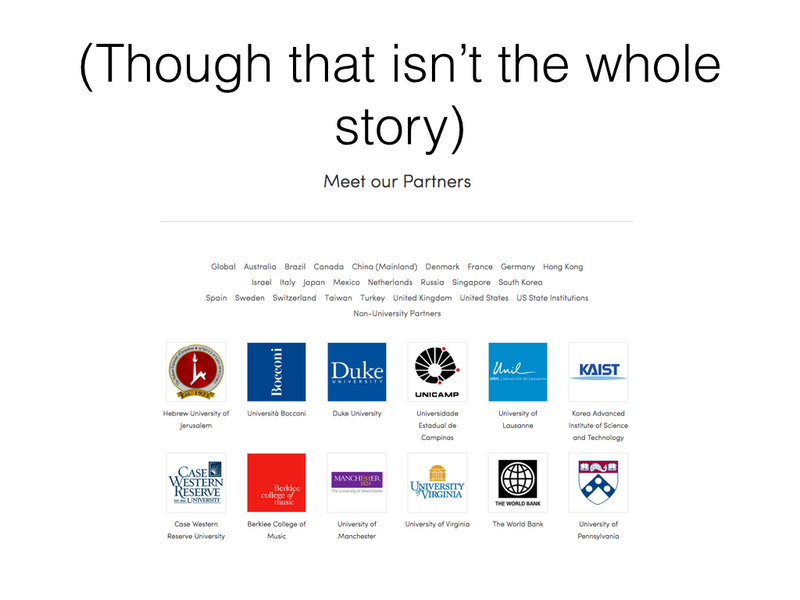 When Charlie and I first started putting together the idea for our edited collection at the CCCCs in Las Vegas in 2013, there was a real mania both in the mainstream and academic press that MOOCs were going change higher education on the scale that the emergence of Google in the late 1990s changed the Internet. After all, 2012 had been declared by The New York Times to be “the year of the MOOC.” At that 2013 CCCCs, there really were people who honestly thought we would all soon be out of a job. By the end of 2013 and after a lot of bad press, the inevitability of MOOCs was not quite so clear. But it’s probably best to think of this latest rapid rise and fall of MOOCs not as an isolated and odd event, but rather as a phenomenon that is another that has to be considered within the context of other innovations in distance education. But that’s a different project. For what it’s worth: it’s been less than six hours since my presentation this evening, and there have been more tweets/retweets of the attending audience, and many MANY more views on this web site. Just sayin’.